Troon’s leadership recognizes the global reach of the company and feels a responsibility to use this influence to "drive” others to act. This means providing opportunities for its associates to participate in a variety of activities that help those in need around the world. Troon wishes to lead by example in this area and set industry standards for corporate responsibility. During the entire month of September, which is officially National Prostate Cancer Awareness Month, Troon daily-fee and private facilities fly a light blue checkered flag on every 18th green to remind golfers about the importance of detecting prostate cancer early. Likewise in October, during National Breast Cancer Awareness Month, pink pin flags and cups are used to raise awareness about breast cancer prevention screening exams. The American Cancer Society reports that 77% of all cancers are diagnosed in those who are 55 years and older, making the message of early detection especially relevant to golf's core demographic. 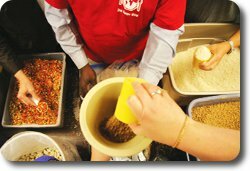 Volunteer – Associates are given the opportunity to join together for a meal packaging event, aiding those in crisis situations and feeding programs for schools and orphanages in developing countries around the world. Raise Support – Facilities have the opportunity to create fundraising tournaments or donation drives to help fund food packaging events. Troon and its associates have proudly partnered with Stop Hunger Now to donate and package more than 40,000 meals to aid those in crisis situations and feeding programs at schools and orphanages in countries suffering from disastrous circumstances.